If you’re anything like me, the minute you lay down in bed your head starts to race through everything that happened to you that day and everything you have to do the next day. Adding in a little bit of gentle, relaxing yoga before bedtime will help calm your mind and prepare you for sleep. In this post, I’ve compiled my five favorite poses for bedtime yoga. These poses will help you stretch out tight and tired muscles and prepare you for a restful sleep. Hold each pose for a few breaths up to a minute, focusing on taking nice, long breaths and quieting your mind. Bridge is a wonderful bedtime yoga pose because it’s technically an inversion, so you get all of the benefits of inversion like stress reduction and improved circulation. Bridge pose also opens your heart, giving the chest muscles a nice stretch. If you’re flexible enough to shimmy your shoulders and tuck them under, you’ll get an even greater heart opener. I would start your bedtime yoga routine with slightly stimulating poses like bridge pose, slowly working your way to more restorative poses. This seated Thread the Needle pose will open your shoulder muscles, perfect for bedtime yoga. Begin in a cross-legged, easy seated position. Next, reach your arms out in front of you. Keep your left arm in contact with the ground and reach your right arm under your left armpit, gently twisting as you reach. Be sure to do this pose on both sides of the body. Half Lotus Forward Fold will help stretch the outer hips and glutes. Begin in Half Lotus pose, with one foot near the hip of the opposite leg. (If Half Lotus is too hard for you to get into, try Reclined Pigeon Pose; it stretches similar muscles.) Then, simply fold forward and melt into the pose. This pose is one of my favorite gentle stretches to do before taking a yoga class. Reclined Bound Angle Pose will help you open up your inner thighs and hips. Simply lie on your back, bring the soles of your feet together, and let your knees fall out to the side. You can even prop your knees up with pillows if that makes the pose more comfortable—just place a pillow under each knee. I always think of this pose as a pose of opening, physically and mentally, so I try to find openness and gratitude in my heart when I practice this pose. For bedtime yoga, maybe think of the things you were grateful for during the day. It’s always nice to end the day on a positive note. Supine Twist provides a nice, gentle twist and stretch through the back, and it’s very relaxing because you’re essentially lying down and twisting over a bit. Keeping both shoulders on the ground will help you get more out of the pose. You can modify the pose by putting a pillow under the knee of the top leg. If you found this post helpful, check out my gentle morning yoga routine to help you loosen up after a night’s sleep. 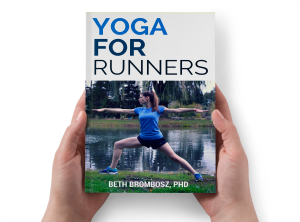 Or, read more about the best yoga poses for beginners. Are you loving the poses in this post? Check out my Relaxing Gentle Bedtime Yoga Sequence! It incorporates many of these poses, and it’s the perfect way to wind down after a long, stressful day. Be sure to subscribe to the Sublimely Fit YouTube Channel, too! Have you tried bedtime yoga? Do you stretch before bed? Do you prefer daytime or nighttime yoga? I usually read before I go to sleep. But when I do bedtime yoga, my favorite pose is legs up the wall. This has nothing to do with the poses, but I like your bedspread!! Great suggestions! I haven’t tried any of those poses, but I might test a few out. Though my bed never looks that nice. There are usually far more lumps in it. Haha, yeah, I definitely spent a lot of time making sure it looked good before taking the photos. Hope you like the poses–let me know how it goes when you do try them! I’m a morning yoga person but the idea of bedtime sounds wonderful. I’m usually a morning yogi, too, but I’ve also found doing a little yoga before bed really calms my mind! how long do you hold each pose? At least 3 to 5 breaths, but you can hold longer if it feels good. If you start to feel any pain or discomfort, pull out of the pose, but since these are gentler poses, you can hold them for a while if you like how the pose feels (and again, if you’re not feeling any pain). Start by holding up to 30 seconds if you’re a new yogi, and extend the length you hold the pose from there. I am a 72-year-old yogi who does yoga and stretching every morning for about 20 minutes. The support of the floor is very important to me, so it feels counterintuitive to try yoga on a bed. Because I am not an evening person, I go to bed and go to sleep. I feel very lucky to have no sleeping difficulties. Hi Joella! Thanks for taking the time to leave a comment! Practicing on the bed is just an example, I would always encourage anyone to practice where they feel most comfortable, whether that’s on the floor, on a chair, or wherever you feel grounded. 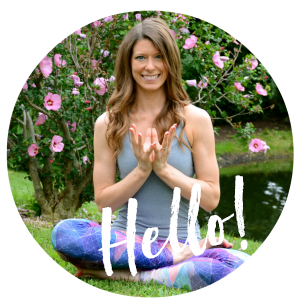 So glad yoga has been helpful for you–it really is a life changer! When I can’t sleep, I find yoga really helps. Great post! Lovely photos. You have a beautiful blog!